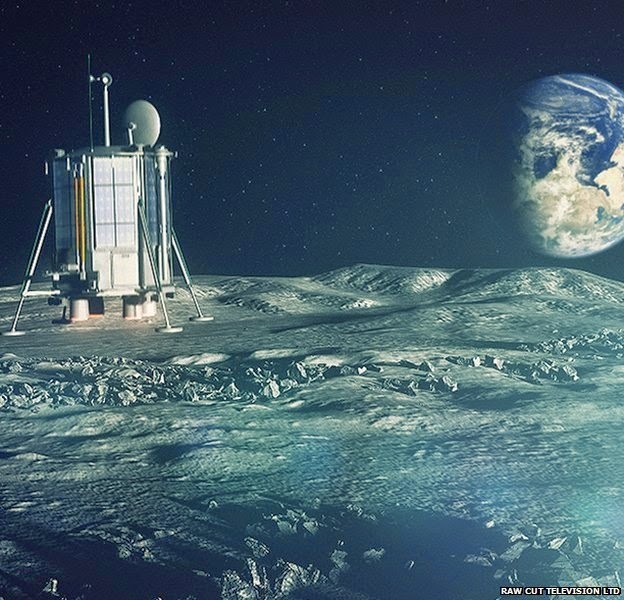 A British-led consortium has outlined its plans to land a robotic probe on the Moon in 10 years' time, despite, and because of, UK government's lack of investment in science and innovation. Its aim is to raise £500m for the project from Kickstarter, i.e. donations by the public. The plan has received the endorsement of a host of well-known scientists and organisations. These include Prof Brian Cox, the Astronomer Royal Lord Rees, and Prof Monica Grady of the Open University. David Iron, who is leading the project, said he was setting up the initiative because governments were increasingly finding it difficult to fund space missions. "Anyone in the world will be able to get involved for as little as just a few pounds. Lunar Mission One will make a huge contribution to our understanding of the origins of our planet and the Moon," he said. The team hope to raise £600,000, using the international crowd funding web service Kickstarter, in the next four weeks to fund the initial phase of the project. For the next four years, funds will be received through contributions from the public, who will be able to buy digital storage space on the lander for their own personal text messages, pictures, music and videos. They will also be able to pay for an immortality of sorts by sending up a strand of their hair, which the project team claim could survive for one billion years. The cost of a short message will be a few pounds, a compressed photo will be a few tens of pounds while a short compressed video will be about £200. The cost of sending a hair sample will be around £50. The lander will also contain a public digital archive of human history and science which will be compiled as a legacy which will survive even if our species becomes extinct. Mr Iron believes the fact that people will have a stake in the mission will make it all the more engaging. "The project's long-term legacy will be a new way of funding space exploration," he told reporters. "Rather than just watching the mission, people can be directly involved, not just through funding but helping to make key decisions such as the selection of the landing site or what should be included in the public archive." All the money raised by the project will go to funding the mission, and any money left over will be put into a charitable trust whose proceeds will be spent on future space exploration. Mr Iron described it as "a Wellcome Trust for space exploration". The mission will also have a scientific component. The aim is to drill and analyse a sample from underneath the lunar surface, something which has never been done before. A key aim of the project is to educate and inspire a new generation to become engaged in science in the same way that the Apollo Moon landings did in the 1960s and 70s, and as indeed the Rosetta landing did just last week.